My job would be a lot easier if I didn’t have to knock on their doors. But this business relies on “the personal touch,” as we like to say. And that’s what I tell myself, that it’s simply business, nothing personal. Of course they all have their stories, but I don’t listen. Fact is, how they lose their homes has nothing to do with me. I just deliver the papers, read the notice, get the signatures, start the ball rolling. Treat every one of them the same. Well, I try to at least. I think that should count for something. Still, folks around town talk, I can tell. They know who I am and what I do. Most people won’t look me in the eye when we pass on the street. Not that I look up at them much either. The bank teller, he glares at me when I make my deposits. And I swear there’s no open tables when I try to go out. My girlfriend says I’m paranoid. I think I just know how people are. Nobody wants a repo man around. I never finished high school and wasn’t any good with cars. Army wouldn’t take me, so I started helping an uncle manage properties. Turned out I was halfway decent at it. Made some contacts in housing after a couple years, and I jumped on board right when the boom was starting up. After the bubble burst, lenders needed help taking back the homes. Found I was pretty good at that too, so now here I am. Wouldn’t make near this much doing anything else. It’s mostly blue collar people on my street. Some young families and a few older couples too. One-story houses that are showing their age, small front lawns, chain-link fences. Maple trees in the backyards. Kids and dogs and toys all over the place. One or two empty homes. Sidewalks that need some work. My girl and I, we usually keep to ourselves. Don’t have any kids which makes it harder to meet people. Once in a while I’ll see neighbors having parties in their backyards. Sometimes think I’d like to host one myself. I’m not sure who would come. I can’t honestly remember how I left that house or if I got through the entire notice. I do know I went straight to the bar and got hammered. Didn’t go in to work for two days. I was put on probation for three months, even though we took the house without a fight. That was two years ago. Anyway, I rarely run into these people again after property seizure. They usually shack up with a cousin or move to Minnesota or something. Darla was the last one I expected to stick around. That Saturday, I thought maybe she hadn’t seen me at first. I ducked my head, scrambled up the porch like I had something on the stove. When she called my name, I cursed my luck. Wasn’t even safe at my own house. I turned around, made like I didn’t recognize her. She saw through it. Turned out her sister’s family bought a home down the street, and Darla was going to live with them, help with the kids. I nodded, tried to avoid her eyes. She’d seen me mowing the lawn the other day and wanted to say hello. Thought it was good to get to know your neighbors. I mumbled some sort of welcome, said I had to get to some things in the house. She said she’d see me around. I told myself I’d never mow that lawn again. That summer got pretty busy. Business was picking up, which meant longer hours and more day trips out of town. I mostly tried to avoid her house, but every now and then I’d forget and drive past. Sometimes Darla would be outside, playing with her sister’s kids. If she saw me or waved at all, I didn’t notice. My head never moved an inch. My girlfriend is no social butterfly. She prefers her TV shows to going out at night. That’s funny to me, because I’m pretty sure she’s in front of the tube most of the day, too. We like to say we’ve got “a mutual understanding.” I don’t think I know what this means. Things were just fine at the end of that summer, all things considered. Projects in the yard and the garage kept me busy and out of the house. My job was always gonna bring stress but maybe I didn’t need to think about it so much. Plus, football was starting up soon. So I nearly exploded that first week of September when I learned we were having Darla’s family for dinner. I didn’t know how or when she met my girlfriend, or what the hell they would have even talked about. Not to mention inviting her to our house! At first, I outright refused to join in. This had to be the most horrendous idea my dim-witted girl ever came up with. And there have been some bad ones. I was furious and I let her know it. A man’s got a right to privacy in his own home. I was at the grocery store three days before the dinner. Almost never go during the workweek but we had run out of sandwich meat so I stopped by on the way home. After I got done at the deli I thought I might as well grab a few extra items. Pickles, tuna, mayo, potato chips. Went past dairy, picked up some eggs, then turned the corner to the produce section. I’d been trying to eat healthier so I forced myself to the fruit. Our bananas were getting those little brown spots and I wanted some new ones. Picked up a ripe bunch and also a bag of spinach. I was thinking about Sunday’s football games when I heard two kids’ voices ahead of me by the citrus fruit. Looked up and there they were, Darla’s niece and nephew. Grabbing as many apples and oranges as they could hold in their little arms, right between me and the checkout aisle. They probably didn’t know who I was, but Darla couldn’t be far behind. I’d have to turn my cart around before she saw me looking at them. I spun around quick. Heard and felt the crash before I even saw Darla. She was behind me and I’d run right into her cart. Couldn’t help thinking she had trapped me on purpose. It was highly inconvenient and I was annoyed but of course I had to say something. “Doing good, doing good. Busy as always.” I paused for a second, unsure how to make my getaway. A lump in my throat. Suddenly nervous, but I had to stand up for myself. I never got a chance to finish the sentence because the kids had run over to us, laughing and spilling their fruit all over the place. My instincts took over and I knelt down to help pick everything up. The kids tried to help too and spilled every last piece of fruit in the process. Each time I picked up an apple or orange, they took it from my hand and gave it to Darla. Each time they took one from me, a tiny little “thank you” squeaked out of their mouths. My girlfriend and I tried starting a family four years ago. Thought the time was right I guess, plus we weren’t getting any younger. But it didn’t take, and we never figured out why, just kinda let it go. I was traveling so much anyways because of all the foreclosures. Didn’t have time to see a doctor. And my girl wasn’t thrilled about going in by herself. I don’t know how things changed so quick for me in that grocery store. One minute, I had no desire to be anywhere near that dinner. The next, I knew I wouldn’t miss it. Seeing those kids running and laughing…it made me want to do something good, something new. In fact, I realized I was starting to plan out a menu in my head right there on that floor. I stood up, still not really looking Darla in the eyes, but definitely feeling more calm. Said I had to finish my shopping but was looking forward to having them over. Probably smiled as I said good-bye. On the way home I started to question things, arguing with myself about going through with it. I was so damn restless when I walked in the house. My girl probably noticed right away but didn’t say anything. I fiddled around in the garage for an hour, which seemed to help a little. Finally came inside, sat down and asked how I could help with Sunday’s dinner. She turned from the TV and looked at me funny. I thought I would have more to say, but I just stared at the couch and waited. She kinda shrugged her shoulders after a few seconds, asked what kind of food we should make for it. Never mentioned me yelling at her or changing my mind. Later that night I couldn’t fall asleep. It was strange. Things I hadn’t felt in a long while. Excited but also anxious, both at the same time. Felt something else too, something harder to put my finger on. The next two days went by fast because we had so much to do. I raked dead leaves off the lawn and my girl pulled weeds. We cleaned the whole house, even our bedroom. Maybe dinner guests are the cure for a lazy girlfriend. I tried not to think about Darla and the kids too much. 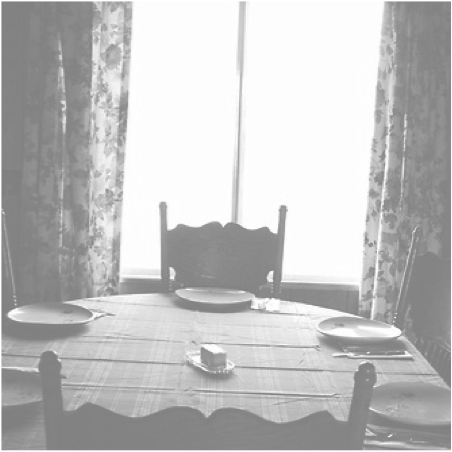 My dining room table has been in the family for three generations. It’s solid oak and weighs a ton. Didn’t really want it when my parents passed, but couldn’t bring myself to give it away. These days, we always eat in the TV room, so it just sits there unused, piles of papers and other messes scattered on top. When I cleared off that table to set it up, my mind slowed down for a while. Still didn’t sleep very well. The night of the dinner I could smell fall in the air. The wind was picking up and there were more leaves on the lawn. The kids came into our house first, then Darla. Took me a minute to realize the kids’ parents were there too, standing behind them. I’m not sure why I had only planned for three guests. I ran to the dining room to make extra room. I was proud of the spread. It was a feast compared to what we normally ate. I used my favorite oven roasted chicken recipe for the first time in years, and my girl made mashed potatoes and green beans. I dusted off old linen tablecloths and used three candles as centerpieces on the table. Darla’s family brought bread and wine and dessert. The kids said it smelled delicious. We all agreed. We dimmed the lights for the meal. It started out better than I expected. The kids used their "silly voices" to answer our questions and we all laughed. Their parents didn’t say much at first. Mostly polite talk about weather and football and the school system. A few times there was a pause, but someone always spoke up, kept things going. Darla asked us some questions. Things like where we grew up, what our families were like, how we liked our home. Another lump in my throat. That same feeling was coming, the one keeping me up at night. Our table has some markings from when I was a kid. I’d carved my name and all sorts of shapes in the underside with my dad’s knife. Had to sand them all down as punishment but there’s still some traces. My fingers started rubbing over those old carvings while I answered Darla. Her brother-in-law finally asked me the question. “What do you do for a living?” My blood froze. I thought they had known. Was sure Darla would’ve told them. How could she not? Especially if they were coming over for dinner? Looked at my girl, who was occupied with her chicken. I turned to Darla but she was helping the kids with their food, calm as ever. My hands were tracing the figures under the table, over and over, faster than before. I realized I was holding my breath. Outside the industry, I have my standard response to this question. It’s all I could think of. “I’m in real estate,” I said. Actually, ‘spat out’ is more like it. My dear girl looked up, probably for the first time all meal. This sick feeling hit my stomach. I knew what was coming. I wanted to kick her leg but couldn’t reach that far. She explained my job in as much dirty detail as she could. For thirty whole seconds. God bless that oblivious woman. I watched the parents slowly put down their forks and stare at me. My fingers stopped moving under the table and I think I slouched into my chair. Pretty sure I heard the husband curse under his breath, but Darla’s sister was the one who spoke up. She was breathing heavy and it took a few seconds for her next sentence to come out. Everyone was silent. Even the kids. I heard all her sister’s words. Damn, I heard her clear as day. But I couldn’t look at anyone but Darla. To me the whole room was fuzzy except for her. And Darla wasn’t moving either. Just staring across the table with this sad look on her face. Only turned her head when her sister started on her. When I’m at my job, insults roll off my back. It’s why I’m good at what I do. But in my own home, I have a short fuse. You can get the hell out if you’re going to disrespect me like that. Or I’ll call the cops. But this time I didn’t get mad. Wasn’t able to. Instead I just felt this heaviness all over me, so much that I couldn’t even speak. My eyes were fixed on the table now and they weren’t moving. She stopped mid-sentence and stood up. Then her husband did. They grabbed their kids’ hands. My head was still down but I knew exactly who he was talking to. I looked up and saw a couple tears on Darla’s face. I felt terrible. Then a few moments of silence. She turned to me and for the first time I didn’t shift my eyes away. Found my strength and stood up too. I’d at least see her off. I’ll never forget her hands, moving slowly toward that bread basket. I prepared for the walkout. She’d take her bread with her. It would only be fitting. She had to be messing with my mind. But she broke off a piece and set it on my plate. She was smiling at me. After the parents and kids left, I wasn’t much for talking. Kinda hard to make sense of what had happened. Darla seemed content just being there, eating with us. So my girlfriend kept the conversation going. That was a nice surprise. Even asked me some questions to help me out. After a while we got to talking recipes and favorite meals. Actually ended up sitting at that table for another hour. Darla wouldn’t leave until we planned another dinner. Our table has been clear of papers for three months now. We don’t have every meal there, not by a long shot. But we get in a couple each week. And that doesn’t include Sunday nights. Darla’s been over five or six Sundays now. We try a different recipe each time. I forget how funny my girl can be. Darla seems to bring it out in her. Sometimes I have to separate them in the kitchen or else the food will burn. Turns out Darla’s a pretty good story-teller too. But her real talent, that shocked us all. That woman really knows her food. I keep saying she missed her calling somewhere along the way. She’d make a great restaurant critic. I’ve started looking forward to dinner after work. Even when my girl and I get in an argument. Happens more often than it used to, actually. But I don’t think that’s a bad thing. And Sunday night – well, that’s the highlight of the week now. I know we’ll eat well, tell some stories, joke around with Darla. She even brought the kids one time. Darla and I still haven’t talked about her mother or the repo notice. Sometimes I wonder if she’s just waiting for the right moment. And I’m ready to listen if she wants to bring it up. But as the weeks go by and we become better friends, I’m starting to believe she doesn’t need to.